Have you ever thought during the long winter months, “I just want to be able to sit down with a bunch of people who love baseball as much as I do?” If so, you’re not alone. A whole bunch of baseball fanatics will gather in Phoenix this weekend. The long baseball offseason is almost over. We’re less than a month from Opening Day, and right now the baseball world revolves around MLB Spring Training camps in Florida and Arizona. That goes for baseball fanatics, too. Well, the Arizona part. At least for a weekend. The 5th Annual SABR Analytics Conference begins tomorrow in Phoenix. As always, SABR (Society for American Baseball Research) has assembled an all-star lineup of speakers, panelists, presenters, and moderators. The conference brings together baseball fans of all ages who are interested in baseball statistics, especially sabermetrics. In case you’ve never heard of sabermetrics, it’s a system of new and advanced baseball stats that show a player's value to his team beyond traditional metrics, like RBI and ERA. SABR stats also give teams insight into how valuable a player is compared to someone else who plays the same position. Advanced stats work together with traditional ones to give teams — and fans — a more complete picture of a player and his abilities. The SABR Analytics Conference brings together hundreds of walking baseball encyclopedias and some of the top names in the baseball world. Some of the speakers and panelists that attended last year included Giants CEO Larry Baer, former players and current ESPN analysts John Kruk and Curt Schilling, and Hall of Fame manager Tony La Russa. Last year’s conference was pretty great. 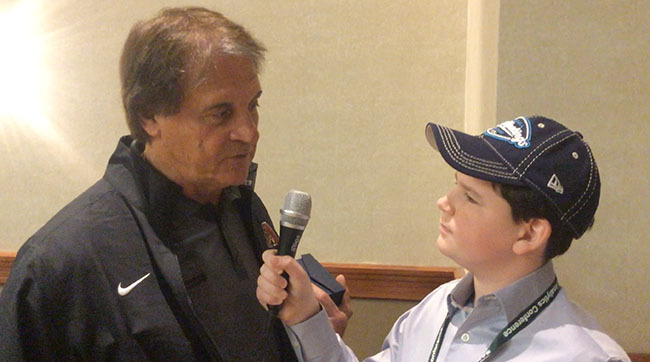 Check out my recaps of the three-day event to watch interviews with Schilling, La Russa, and Doug Glanville. This year’s event could be just as good as 2015. It will feature ESPN analysts and former MLB players Aaron Boone and Dallas Braden, who will take part in a panel about the analytics behind pitching and hitting. Another can’t-miss event will be a Q&A between Arizona Diamondbacks CEO/President Derrick Hall, and Ken Rosenthal from FOX Sports. While analytics may occasionally come up, Hall is sure to discuss how he rose to the position he has today and what it is like working with a pro team, while sharing some anecdotes along the way. I’ll be at the conference all weekend, reporting on the different panels and opportunities for SIKids.com. Check back for my coverage Friday and Monday. And check out SABR.org to learn more about the conference and the organization behind the stats.